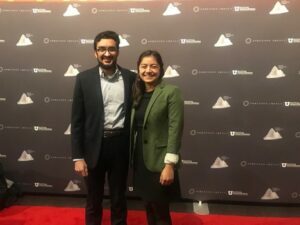 Afras Sial (left) and Alyssa Alfonso (right) attended the Sorenson Impact Center Winter Innovation Summit as Student Delegates this past February. What was your first impression of Utah? What were you thinking on the way to WIS? Alyssa: As I caught my breath in the Salt Lake City airport before heading to the University of Utah campus for the summit, I was nervous, excited, and a bit unsure of what the week would have in store. A foot of snow was in the forecast, which I had a feeling my work-appropriate flats squeezed into my carry-on were not equipped to handle. Similarly, I wasn’t sure if I was ready for three days of nonstop networking, panels, and ultimately creating a proposal to solve college affordability and the student loan debt crisis. An introvert at heart still learning how to share my narrative, the idea of giving my spiel to a “real professional” at a mission-driven organization made my feet go cold. But soon after arriving at the welcome dinner with each of the other 20 student delegates from social impact centers based in universities around the country, I felt much more reassured. A mix of undergraduates and graduate students, it was comforting to be surrounded by students who were all engaged in and passionate about the social impact space. Afras: Arriving in Utah, although I was returning to my home state, I found myself in a different state of mind. Rather than returning home for a winter or summer break, I had come to represent the Beeck Center in the Student Coalition for Social Impact as part of the Winter Innovation Summit (WIS). WIS describes itself as “the premier cross-industry event in social impact, innovation, and investing,” gathering “policymakers, funders, nonprofits, and social entrepreneurs to explore the future of social innovation across the globe.” From our dinner on the first night, I could already see how WIS was realizing this vision as I met diverse students from across the country who shared a commitment to leaving the world better, but each in their own unique way. The next day, the summit began with a keynote by Mayor Michael Tubbs of Stockton, California. His story of choosing to return to his struggling hometown after “making it” in more elite circles set a reflective mood for the summit, challenging me to recenter my goals on impact, even if they were not nestled in buzzword-laced sphere of social impact. What experiences prepared you for this moment? Afras: Without my experiences with the Beeck Center, I would not have had the vocabulary or perspective to digest the discussions and challenges we encountered at WIS. As a student analyst, I learned about the impact investing space, early childhood development programs, and public-private partnerships, all of which featured prominently throughout the summit. Later as a GU Impacts Fellow at the Center for Civic Innovation in Atlanta, I experienced a more grassroots approach to social impact. That experience enabled me to think more critically during the summit about how policy innovations, like income-share agreements in higher education, affect individuals beyond the data. Nevertheless, the data remains important, which I learned while studying impact evaluation systems as a student researcher at the Sorenson Impact Center, an opportunity the Beeck Center was instrumental in helping me access. Now as a student of economics, I was pleased to hear from panelists on topics ranging from AI to housing affordability and health innovation how the empirical methods we learn and practice are being implemented in real-time (as opposed to multi-year academic endeavors) to achieve better outcomes. Alyssa: As a junior, I had the opportunity to work with Harlem Commonwealth Council on their annual Impact Report, where I partnered with a team of graduate students to identify a range of measurable factors to correlate with impact. I also had the opportunity to work with Federal City Council as a GU Impacts fellow in summer 2018. Federal City Council worked in a variety of project areas, all centered around helping growth benefit all residents of the District, not just a select few. In writing a grant to pilot an Accessory Dwelling Unit program and working group to increase the amount of affordable housing in DC, building curriculum for students with community-based nonprofits, and attending meetings with BIDs and executive agencies, I was exposed to a huge variety of players and ways to get involved in mission-driven work. As I engaged in conversations with other students and young professionals from social impact organizations like the Lumina Foundation, Third Sector Capital Partners, and the Urban Innovation Fund, I was almost surprised at how much how much my work as a fellow informed my participation in conversations and what I was able to contribute. What surprised you most about the WIS? Alyssa: What most surprised me about the Summit was the network of connections I was able to form in just three short days of panels, keynotes, and skiing. While chatting with a student delegate over lunch on the first day, I coincidentally ran into a woman I had the opportunity to work with as a GU Impacts Fellow last summer – at the time of writing this blog, we’re planning to get coffee next week to talk more about her work and how she found her way into the social impact space. When another student delegate heard I was interested in affordable housing, she immediately put me in touch with her peer at Berkeley. We hopped on the phone together and spent over an hour talking about the importance of housing as a social issue that encompasses questions of mobility, equity, and the wealth gap in our country. Engaging in organic conversations like these made me feel much more comfortable sharing my own narrative as well as asking questions about their work. Now that the summit has concluded, I feel confident that I can not only continue but also initiate these conversations. I’m grateful that I was able to build on my previous experience at the WIS Summit to further conversations and my understanding of social impact. In the end, a summit is just a series of questions and conversations. We’re glad these conversations were ones we won’t soon forget. Afras: One of our final experiences with the Student Coalition for Social Impact at WIS was its first-ever Impact Hackathon on college affordability and student debt. After five hours, our solution was still a bit rough. As a group of twenty-one students, we struggled to maintain consensus and seam together all the solution’s disparate components. However, at the end of it all, even if our solution does not generate impact itself, I know I will not forget the impact of the stories shared by our peers. As we worked to hone in on our issue, we heard from inspiring students like Alex, one of the few to leave foster care and complete an advanced degree, and Huda, who would not give up on the fight to increase student access to mental health resources.